My novel, DOUBLEBACK, (October 2009) features both Ellie Foreman and Georgia Davis as co-protagonists, and I’m often asked how they originally met. Georgia made an appearance in A PICTURE OF GUILT, and then more substantively in AN IMAGE OF DEATH, but they already had a passing acquaintance. How they met is explained in this story, written and published in 2009. The story was published in a limited numbered edition. It is also part of NICE GIRL DOES NOIR and is available in print, audio, and electronic formats. Katie Boyle had a perfect body, a beautiful face, a terrific sense of humor, and a law degree. So it wasn’t surprising that people hated her. 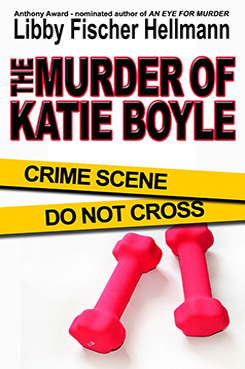 Still, when I found her body in the closet of Bodyworks, her exercise studio, on a sunny spring morning, I was stunned. Murders don’t happen on the North Shore of Chicago—not often, anyway. I wouldn’t have found her at all if I didn’t have the annoying habit of being early. Promptness on the set is non-negotiable in my video production business, and it’s spilled over into the rest of my life. When I’m early, as was the case that Monday, I help Katie haul out the weights, bands, and other paraphernalia she uses to torture us. The studio occupies an area of the village we euphemistically call downtown, but is really not much more than a couple of strip malls on both sides of the street. I parked in the lot, went inside, and climbed the steps to the second floor. I stopped in the hall. The door to the studio was unlocked, but the lights were off. I was mildly surprised. Katie usually arrived well before class, a steaming cappucino in hand. I flipped on the lights and went into a tiny reception area. I love the smell of coffee even more than the taste, but there was no rich, dark aroma wafting through the air. Instead, I noticed a stuffy smell, as if the studio had been full of people and needed airing out. But there’d been no early class this morning. I peeked into the studio. It was a large comfortable room with a thick rug—one of the only carpeted exercise studios I’d ever seen—and mirrored walls. As I looked around, I caught a glimpse of myself frowning. I was surprised, although I’m not sure why. Did I think I was invisible? That I somehow wouldn’t register a presence? I pushed the thought away. I’d ponder my psyche later.